An Apple developer document published this week suggests iOS 11 will open up near-field communications hardware in iPhone 7, and presumably future iPhone, iPad and Apple Watch models, beyond Apple Pay. As outlined in a developer resource published after Monday's Worldwide Developer Conference keynote, and later spotted by Engadget, Apple's next-generation mobile operating system will include a "Core NFC" framework for accessing certain high-level aspects of existing and future NFC hardware. More specifically, developers will be able to build apps that can read NFC tags compatible with the NFC Data Exchange Format (NDEF). Apple notes NFC NDEF tag reading is supported on iPhone 7 and 7 Plus devices. "Your app can read tags to give users more information about their physical environment and the real-world objects in it. For example, your app might give users information about products they find in a store or exhibits they visit in a museum," the document says. The document's language suggests iOS 11 will extend the NFC capabilities of Apple devices far beyond Apple Pay, which is currently limited to contactless transactions and digital ticket management. Apple has restricted third-party access to NFC hardware since it first incorporated the technology in its portable product lineup with iPhone 6 in 2014. The company even limits its own use case to the Wallet app, a decision made to protect consumers from nefarious actors. Apple hinted at an expansion of NFC capabilities yesterday when VP of Technology Kevin Lynch announced watchOS 4. When the new operating system drops this fall, Apple Watch users will be able to interface with gym equipment by tapping their device on an NFC reader, which subsequently opens a two-way wireless communication session for transferring information like heart rate and equipment speed and angle. 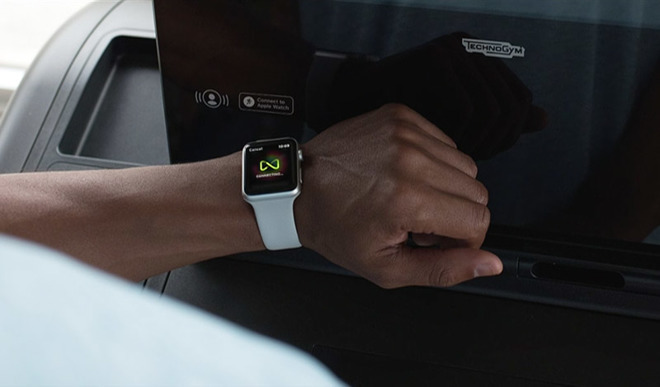 While the details have yet to be fleshed out, the technology promises to make iOS and watchOS devices more relevant in a growing ecosystem of connected devices.